Globular clusters (GCs) are densely packed star globs. A sphere with a radius from the Sun to Proxima Centauri, contains only two stars. A similar sphere in the core of a GC may contain ten thousand stars. 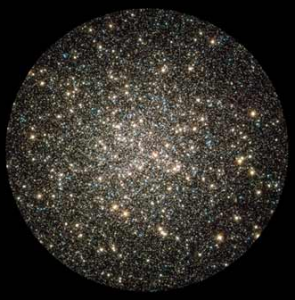 The GC “47 Tucanae” contains millions of stars and M13 has about 300,000 stars. Viewing M13 with a backyard telescope is an experience you will never forget. Image Credit: NASA / Hubble telescope. This image does not show the outlying stars of M13 that form a halo around the core of the cluster. Most of the 150+ globular clusters in the Milky Way are grouped in a halo around the galactic core. They are unlike open clusters with relatively few stars that only exist near the spiral arms. GC are not dusty. Only a handful contain a dusty nebula. Nebulae are space clouds that surround active stars that are ejecting streams of gas and dust. Nebulae are rich in nitrogen, carbon and oxygen, unlike the composition of globular clusters. The stars in each GC have similar compositions, suggesting that they formed together. Open clusters have different concentrations of heavier elements than globular clusters. Astronomers from the University of Texas found that the core stars in all the globular clusters they examined are rotating together around a central axis but the outer stars orbit randomly. Perhaps 16,000 GCs surround M87, the central galaxy in the Virgo cluster. About 160,000 GCs form a halo around the central elliptical in the cluster Abell 1689. We know that cluster galaxies are related because they are imbedded in an X-ray cloud. Abell clusters contain hundreds of dwarf galaxies grouped around the central ellipticals (that are also intense X-ray emitters). Image credit: NASA and the Hubble team. 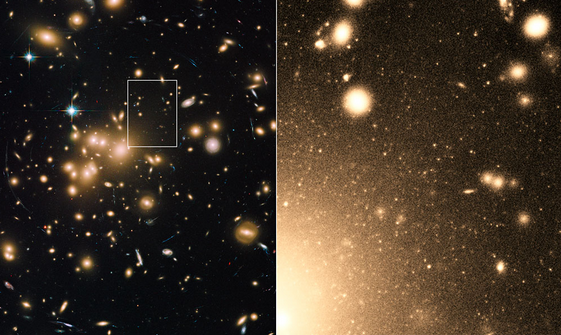 The left view is of the central area of Abell 1689. The right inset – the halo of globular clusters around the central elliptical in this cluster. The most powerful evidence for creation is the visible continuum of galactic history. First he created (completed action verb) the plural heavens and the Earth. The Earth at first was unformed and dark. Then God’s wind dithered in unbroken continuity above the Earth’s primordial surface and he continued to command light to continue to be. (Most of the Hebrew verbs in the Creation account are imperfects and participles, showing repeated actions). To this day, light continually dithers around within all substances energizing and giving them extension. Were the galaxies also originally unformed? Beginning on the fourth evening and morning, God continued to say, Let lights shine in the spreading place of the plural heavens (raqiya shamayim) for dividing days and nights, seasons and years. (Raqiya is the noun form of the verb to spread out). He continues to fashion and make the Sun, Moon and stars and continues to make them into spreading things in the heavens (raqiya shamayim). About once a day NASA detects intense gamma bursts arriving from the creation era. The bursts often appear in the area where the arms of ancient spiral galaxies were forming. Evidently we are seeing God repeatedly commanding light to energize and spread out the unformed things he created first. The ancient sky (observed in the Hubble Ultra Deep Field) contained chains of star globs with equal spacings like beads on a necklace. Some chains may be spirals (seen edge on) as star globs periodically emerge from the unformed substances in the core. Some early galaxies look like tadpoles with granular tails. Closer face-on spirals are surrounded by strings of star globs that have rotated around only part of a turn. Often the star globs are bluer than the core from which they emerged. Early spirals did not have pronounced bulges and bars like local galaxies. Galaxy shapes keep changing throughout cosmic history as globs packed with stars emerge and spread out from the core, often forming local, giant, growth spirals like our Milky Way. Dwarf companion galaxies evidently emerge from the nucleus of large galaxies. M87 has a enormous jet that is aligned with a long string of small galaxies that points towards two large galaxies, M86 and M84. The Magellanic galaxies are connected back to the core of the Milky Way by a river of neutral hydrogen. Evidently they were ejected from the core of our galaxy and left behind a wake of gas. 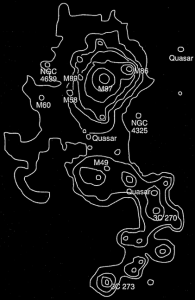 Image is an X-ray map of the Virgo cluster from Halton Arp’s Seeing Red page 131. 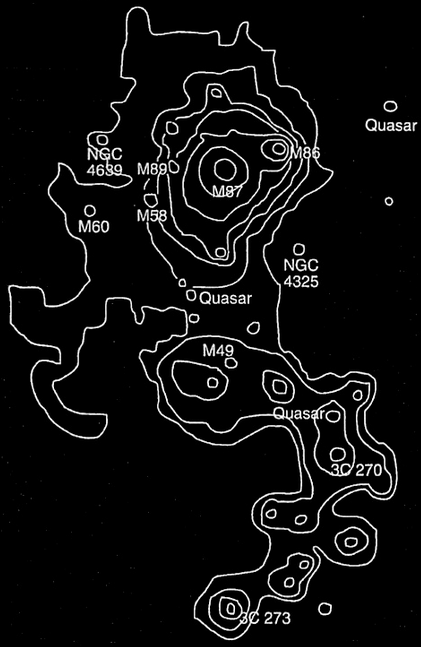 The most intense X-rays emanate from M49 in the south along with various quasars. In the north, M87 is a focus of X-ray activity and its jet points towards M86. In countless galaxies in all directions the visible continuum of cosmic history shows matter emerging and spreading out from the unformed things God created first. A Christian trained in the traditional creation account (based on the perfect verbs in the Latin Vulgate) might object. “The Bible says the heavens and Earth were finished by the seventh day.” The finishing verbs in the Hebrew of Genesis 2:1-2 are imperfect. God finished the intensiveness of creating the heavens and the earth, but the finishing continues. Thousands of years later, God says he continues in unbroken continuity to call the stars to come out (Isaiah 40:26). A Christian might insist, “He spoke once and created instantly out of nothing.” The traditional interpretation based on the Latin Vulgate, is not supported by the Hebrew text or visible cosmic history. “Wait, the Bible says the Earth is young.” There is not a single verse that alludes to a young earth. There are many Bible verses that refer to eons. Hebrews 11:3, He commanded the plural eons to passively form from unseen things. We verify with telescopes how vast eons passively occurred as galaxies grew from the unseen matter in the core of each galaxy. The atomic clocks accelerate along with the outward accelerating, growing star streams. Even local atomic clocks, when compared to their transponded reflections from hours ago, also accelerate in the same manner (relative to distance) as the atomic clocks in hundreds of billions of ancient galaxies. We should not force the universe or the Bible to fit science. Scientific definitions of matter and time, their measuring units, their mathematical methods, their laws of physics and their cosmologies were contrived with a single assumption. What assumption? Peter predicted that in the last days mockers would reject the evidence that the plural heavens are out-old (Greek ek-palai) because of an idea – that all things that exist remain the same 2 Peter 3:3-6. The notion that matter remains the same as it ages is the historical, fundamentalist basis for western science. New telescopes are examining the creation era. Scientists have invented the greatest system of mythology in history, the 99% invisible universe, to prevent what is visible from being so. They imagine that the vacuum of space time stretches light and pushes galaxies away. They speculate that 84% of all matter is invisible, trying to force their mathematical laws on a universe where none of them work. They theorize how stars condensed from space dust when we can see at many ranges and in billions of examples how the stars emerged from things not seen, as in the biblical text. How great will be the triumph of the biblical creation account over science.